Mark Lawrence: Venn in doubt! There is a post on Fantasy-Faction explaining why Fantasy-Faction overlord Marc Aplin advises against self-publishing. This is interesting in its own right, and interesting because Fantasy-Faction are one of the blog sites taking part in the Self-Published Fantasy Blog-Off #SPFBO. The post has sparked an enthusiastic discussion in the comments, on the Fantasy-Faction Facebook group, and on twitter. For me the important thing to note is that the Venn Diagram above is not in question. Nobody denies that all the sections on it are populated. The only debate is just how large each section is as a proportion of the whole, and how best to roll your personal dice when joining the game. 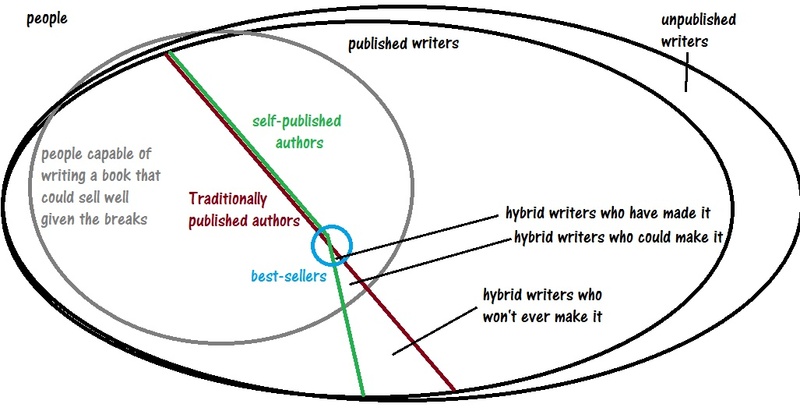 - You can write a best-seller as a self-published, traditionally published, or hybrid author. - You will earn more per book sale (as a percentage) as a self-published author. - You will have to wear more hats as a self-published author. - If 12 agents reject you in a row you need to consider if your book is good enough ... but on the flip side you may be JK Rowling or William Golding. The question is not IF a good book can be rejected N times, but how that information changes the odds of it being a good book. The same debate over the relative sizes of these zones and intersections applies to the readers too. They stick a pin in the Venn Diagram above. Will they be lucky and stick it into the best-seller zone even before that book has a chance to realise its full potential? Will they find a great book that aligns with their taste ... or awful dreck? In the SPFBO we hope to find a wonderful self-published work of fantasy that all the bloggers can rave about and that we might be able to boost onto a larger stage. We've already found quite a few books that the bloggers have been enthusiastic about. I really hope we do find a brilliant novel. We need to be cautious too though. Success is hoped for, not guaranteed. If you choose 27 self-published books at random what are the chances that the best of them will be good? What are the chances it will be great? What are the chances it will rock your world? The same question applies to the whole 267 under consideration. I don't know the answer. I do know that my agent accepts onto his list about 1 in 1,000 of the writers who send him their manuscripts. And of those about 50% get a publishing deal. And of that 1 in 2,000 only a small percentage - I'll guess wildly at 10% make it 'big' (another vague arm-wavey term). So that's 1 in 20,000 of the writers approaching my agent succeeding and making it 'big' with him at their side. So what hope 1 in 267? Anyway. I really just wanted to post the diagram and underscore that nobody disputes its form, just the relative size of those regions! So what constitutes best seller...I know that one of the finalists has sold over 10,000 paid copies on amazon since first releasing the book this year...does that count? If not, what would you consider by he threshold? As to what constitutes a Best Seller ... how long is your piece of string. Prince of Thorns is 4 years in print!